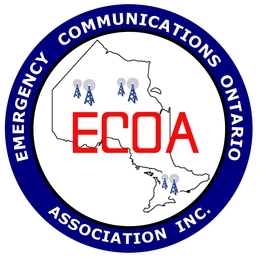 ECOA Ontario: ECOA - "To Serve and Communicate"
ECOA is building EmComm leadership for Public Safety and Service in Ontario. This is your opportunity to consider joining our new Provincial Association with all the following benefits of membership available at one low cost annual fee. 1. Blanket liability Insurance coverage with no conditions. 2. Effective online Amateur Radio and EmComm training material and resources. 3. Government funding and grants to upgrade communications networks. 4. The latest EmComm news events available on two online websites and also a linked Blog for comments and postings related to Emergency Communications. 5. Free website hosting for EmComm Chapters and Groups throughout Ontario. Chart your volunteer EmComm future with ECOA and enjoy community and public service planning with coordination that will keep Ontario on the leading edge of Emergency Communications technology today and tomorrow.